More than 80 people, including at least 30 children and 20 women, were killed in a chemical attack on the Syrian town of Khan Sheikhoun early Tuesday, and the toll could still rise. The Alyousef family, one of the town's main clans, was hardest hit with 22 dead. The grief-stricken father cradled his nine-month-old twins, Aya and Ahmed, each in the crook of an arm. Stroking their hair, he choked back tears, mumbling, "Say goodbye, baby, say goodbye" to their lifeless bodies. Another member of the family, Aya Fadl, recalled running from her house with her 20-month-old son in her arms, thinking she could find safety from the toxic gas in the street. Instead, the 25-year-old English teacher was confronted face to face with the horror of it — a pickup truck piled with the bodies of the dead, including many of her own relatives and students. "Ammar, Aya, Mohammed, Ahmad, I love you my birds, really they were like birds. Aunt Sana, Uncle Yasser, Abdul-Kareem, please hear me," Fadl said, choking back tears as she recalled how she said farewell to her relatives in the pile. The tragedy has devastated the town of several tens of thousands of residents. It also deepened the frustration felt by many Syrians in opposition-held areas that such scenes of mass death that have become routine in the country's six-year-old civil war bring no recourse or even determination of responsibility. The U.S. and other Western countries accused President Bashar al-Assad of being behind the attack, while Syria and its main backer Russia denied it. Despite world condemnation, bringing justice is difficult in the absence of independent investigation of Syria's chemical arsenal, which the government insists it has destroyed. "My heart is broken. Everything was terrible. Everyone was crying and couldn't breathe," Fadl told The Associated Press Wednesday in a series of voice messages. "We had many circumstances in Syria and we had many difficult situations. This is the most difficult and most harmful situation I ever had." In 2013, horrific scenes of Syrians flooding hospitals or found dead in their homes after a sarin gas attack that killed hundreds in the rebel-held Damascus suburb of Ghouta provoked international condemnation. A Russian-brokered deal followed, allowing Assad to declare he had destroyed his chemical stockpile and joined the Chemical Weapons Convention. A Doctors Without Borders medical team, which examined a number of victims in a hospital near the border with Turkey, said the symptoms are consistent with exposure to a neurotoxic agent — at least two different chemical agents. 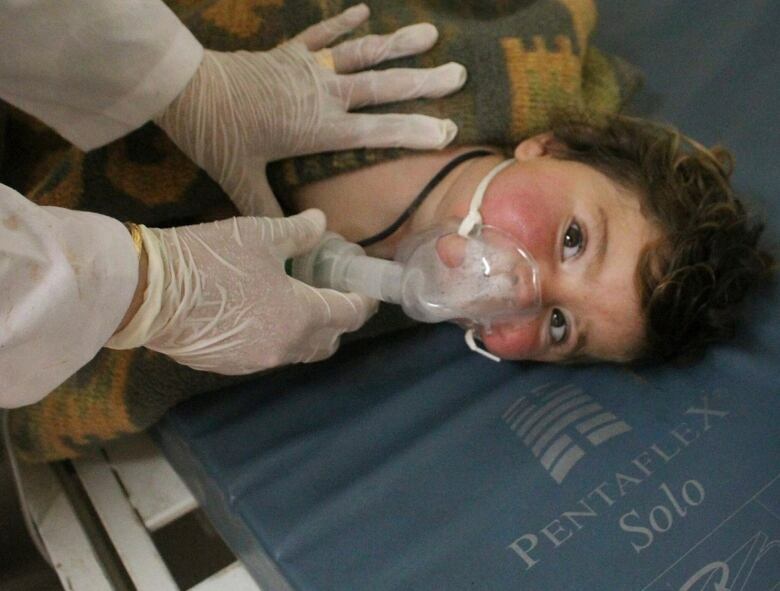 The U.S.'s early assessment is that it involved the use of chlorine and sarin, according to two U.S. officials who weren't authorized to speak publicly on the matter and demanded anonymity. Alaa Alyousef said his family was sleeping and woke to the sound of the impacts only a few hundred metres away. The first thing they saw was smoke. His father went outside then rushed back in. He had seen a woman walking near the strike suddenly collapse. The family frantically closed windows and dampened cloths with water and apple cider vinegar to put over their faces. 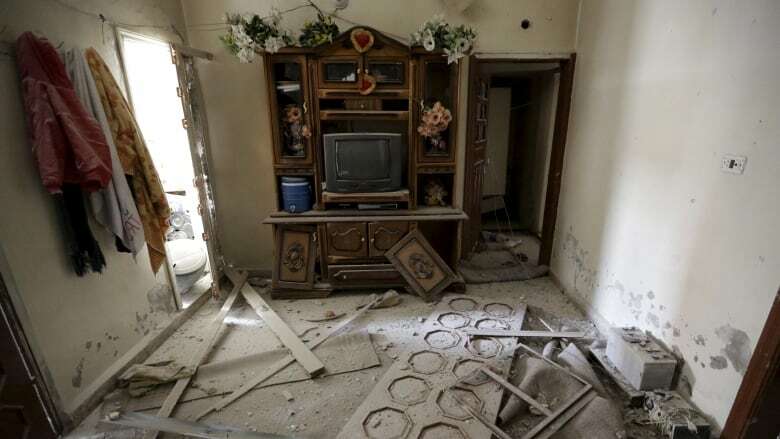 The rockets hit on the edge of North Harah, a district where much of the Alyousef clan lives. Frantically the clan's members and their neighbours fled, running from house to house trying to track down relatives. "My husband, where are you? Oh, where are you my lovely son," she recalled calling out. "They were next to me but I couldn't see them." She said their eyes began hurting. "The air became very heavy. There was no bad smell. But the air was so heavy to breathe." That's when Fadl finally collapsed, she said, only to wake up in a medical centre. While Fadl recovers with her son at her parents' home in a town north of Khan Sheikoun, her husband is still looking for survivors from his extended family. On the way to the grave, Abdel Hameed Alyousef asked a cousin to video his farewell to his children as he sat in the front seat of a van being loaded with bodies. When the airstrikes hit, he was with his twin daughter and son. "I carried them outside the house with their mother," the 29-year-old shop owner told the AP. "They were conscious at first, but 10 minutes later we could smell the odour." He brought them to paramedics and, thinking they would be OK, went to look for the rest of his family. He found the bodies of two of his brothers, two nephews and a niece, as well as neighbours and friends. "I couldn't save anyone. They're all dead now," he said. "Abdel Hameed is in very bad shape," said his cousin, Alaa Alyousef. He's being treated for exposure to the toxin, "but he's especially broken down over his massive loss.